This unit includes 4 colour coordinated large storage trays which can be placed in the open sided compartments at the base of the unit, making them easily retrievable from both sides. 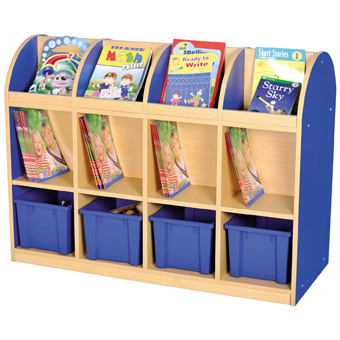 8 cubby compartments and 4 book browser compartments complete this versatile storage unit. Supplied with lockable castors. Trays measure: H210 x W260 x D350mm. Brighten up your classroom with this range of high quality, attractive, yet practical storage units which complement the Milan table and chairs ranges. Available in 2 colours (red & blue), all units have hard-wearing vinyl T-moulded trim with rounded edges and are delivered flat packed for easy assembly. Manufactured from 20mm MDF.